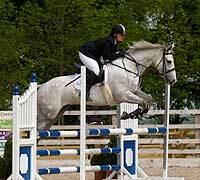 Showjumping can be a long day, especially in the summer when there is a lot of standing around in high temperatures. EquidGel can support your horse's hydration needs before, during and after shows. 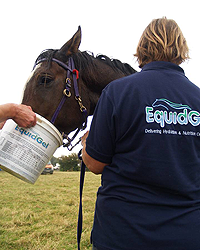 EquidGel is highly palatable; therefore fluid can be given whenever necessary keeping your horse hydrated especially during transportation to events whether it is within the UK or abroad. The high fibre, low sugar formulation provides non heating, slow release energy for the journey and for waiting around, but when your horse is required to jump, the high quality Omega 3 Oil helps to spare glycogen allowing your horse to perform the explosive muscle movements required for jumping, so you can be confident your horse is getting exactly what it needs when it needs it throughout the day for optimum performance. To get ahead in the Dressage arena, horses are being asked to perform more intricate, elastic and powerful manoeuvres, they are like ballerinas who have to be strong, flexible and elegant. This takes incredible amounts of energy and stamina. The hours of training involved requires good quality slow release energy with enough stores of glycogen within the muscles to produce the power for more substantial movements. EquidGel provides your horse with high levels of hydration and good quality Fibre and Omega 3 Oil for energy as well as the essential vitamins and minerals for optimum performance. 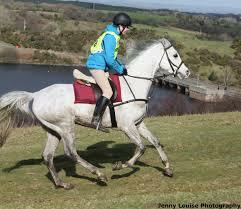 Endurance riders know the benefits of fibre and water to sustain their horses over long distances. EquidGel has been designed to give riders access to a more natural method of keeping their horses hydrated by providing a constant flow of water and nutrition. EquidGel comes in the form of a nutritious thirst quenching drink and because of the horse's natural instinct to forage, the horse will usually take EquidGel over plain water or flavoured water allowing the owner to administer not only water on demand but valuable nutrients and natural electrolytes. EquidGel is the only complete feed that comes in this form and can be used to pre hydrate so that your horse is carrying adequate fluid within his hindgut before the start of a race. It can also be used at crew points and as a recovery feed after the event. This flexible feed is set to revolutionise equine nutrition as it's the only feed that increases the volume of the gastrointestinal fluid reservoir sufficiently to help reduce the effects of dehydration. The majority of people who own horses in the UK are leisure riders, who may enjoy hacking out, travelling to and competing at local and national events. These horses are owned by people who want good value for money whilst keeping their horses in a fit and healthy condition. Keeping horses can be costly; however EquidGel has been designed with this in mind. An all-in-one feed that is balanced, natural, economical and easy to use. It contains all the essential vitamins and minerals necessary for good health, with its high quality fibre and high energy Omega3 Oil EquidGel provides good non heating slow release energy for optimum performance. What makes EquidGel different from all the rest? It is the only complete feed that encourages voluntary fluid intake, so the Old English Proverb " You can lead a horse to water but you cannot make it drink" is not necessarily true, with EquidGel you most certainly can make it drink with every meal! During the dressage test your horse has to be focused and calm, and it has to use slower release energy to perform the intricate movements necessary to score highly. EquidGel uses good quality energy from VFA's (Volatile Fatty Acids) produced by fibre in the hindgut rather than instant energy from carbohydrates which can cause excitable behaviour, coupled with good hydration, your horse will be able to utilise this nutrition for a calm performance. 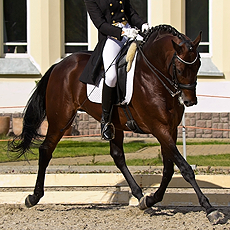 In the Showjumping phase the horse muscles are required to perform explosive movements, therefore the horse uses its stores of muscle glycogen to create the energy, the horse utilises the high quality Omega-3 oil first that produces a glycogen sparing effect which allows the horse to use its stores of glycogen only when it needs to. Pre hydrating with EquidGel before the cross country phase will ensure that your horse has adequate hydration and essential electrolytes to enhance performance during this demanding element. With all cells hydrated, performance can be optimised as the horse draws upon the reservoir in the hindgut to replenish its fluid losses in sweat. 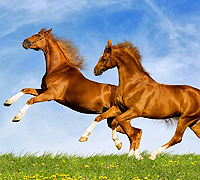 Sustained exercise or exertion, such as endurance, performance horses, hunting polo etc. The ability of EquidGel to hold water within a gel allows more water to pass through the small intestine (the initial site of free water absorption to the interstitial fluid where there is no storage) into the hindgut where it can be stored for use in times of exertion stress. The stored water and nutrition molecules are broken down by microbes to produce slow release energy in the form of VFA's and hydration. Equines working in temperature in excess of 30°C, which include donkeys, asses and mules where heat stress can increase water intake by up to 400%. EquidGel is highly palatable and can be used to provide both hydration and nutrition on demand increasing the gastrointestinal fluid pool allowing a more stable bodily fluid balance allowing these horses to not only benefit from highly nutritious fibre but also to benefit from being well hydrated to perform their work on a daily basis. Natural electrolytes such as sodium and potassium are at adequate levels to help regulate body fluid balance, helping to support those that are lost in sweat. Unfortunately some horses suffer neglect and are found in a state of hunger and thirst - EquidGel provides a highly palatable, easily digestibility meal to a horse that may have a compromised digestive system. EquidGel is a fibre based feed which contains a high level of Omega-3 oil which increases the energy density of the feed to provide slow release energy and good quality protein to help rebuild lost muscle tissue. The storage of excess fat increase body condition, promotes a healthy coat and hooves. EquidGel may be a helpful tool in the rehabilitation of equines and possibly has a use in the veterinary practices before and after elective surgery procedures because of the small particle size and the increased volume of water. Horses travelling long distances - According to the World Horse Welfare organisation, around 80,000 horses travel across Europe every year, and not all of these horses are competition horse, unfortunately the majority of these horses are travelling to slaughter and strict guidelines have been introduced to provide these horses with a better quality of life. EquidGel could be an efficient, labour saving method of providing horses such as these with simultaneous hydration and nutrition on demand allowing them to obtain slow release, non heating energy to enable them to stand in packed crates in addition to being well hydrated for the journey. Performance horses can also benefit from EquidGel before and after travelling for long distances. Many horses do not take in adequate water and nutrients before or during long hours of transportation and it has been documented that the amount of work a horse has to do to keep balanced whilst moving about in the vehicle is equivalent to a fast walk, therefore if the horse is having to perform this type of constant exercise for in some cases 4 hours at a time, it is no wonder they require time to recover on arrival at their destination. The soluble fibre formed allows more water and good quality fibre to reach the hindgut and to provide a constant release of nutrients and water to replenish that used during the journey allowing the horse to arrive seemingly fresh with vitality and requires very little recovery. Many horses nowadays are fussy eaters, EquidGel has a very low level of non structural carbohydrates (sugars), but a high level of good quality alfalfa based forage with a high level of hydration which makes Equidgel highly palatable. With a pH of 6.5 the soluble fibre gel provides a soothing alternative to grain feeds. LamiGel© formulated especially for Geriatric, Good doers and horses prone to laminitis. Because the small particle size fibre allows the horse to gain optimum benefit, horses tend to improve overall condition relatively quickly, fed alongside softened long stemmed fibre such as soaked chaff or alfalfa chop, this combination will help to encourage the hindgut to function correctly and to keep your horse in tip top condition. LamiGel© may also have the beneficial effect of reducing excitable behaviour. It has also been documented that the soluble fibre gel may also form a barrier between the contents of the stomach and the gut wall reducing the absorption rate of carbohydrates into the blood stream. Because LamiGel© is high in fibre but very low in sugar/starch, it contains very little calories from carbohydrates, therefore it provides a good energy source from Omega 3 oil which means that horses no longer have to be starved and can enjoy a good high fibre, low protein, low sugar meal, perfect for Laminitics prone ponies and good doers. EquidGelTM is the perfect feed for horses with dental issues such as those who are undergoing dental treatment due to trauma or disease. Horses lose condition very quickly when they do not get adequate nutrition and hydration and keeping the weight on them, when it is difficult for them to chew is even harder. 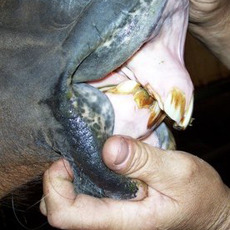 The question is "what do you feed a horse that has suffered mandibular trauma or has other dental issues?". Traditionally a slop of bran mash and grass nuts has been used to get nutrition into these horses, however this type of diet is not nutritionally balanced, therefore other supplements have to be added to provide the vitamins and minerals required to keep the horse healthy. EquidGel can deliver everything the horse requires in an all-in-one feed without the need for additives and supplements.